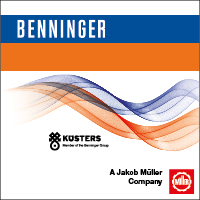 Just a few days before the ITMA in Barcelona, Karl Mayer has announced that, as of 1 January 2012 its Malimo stitch bonding technology will be transferred to textile machinery manufacturer Christian Pinkert Textilmaschinen. The Malimo technology, which was first developed in 1949 by Heinrich Mauersberger in the former East Germany, will be going home to Chemnitz to Christian Pinkert's factory on Annaberger Strasse, the site of the original Malimo factory. The Malimo technology was acquired by Karl Mayer in the early 1990s after the collapse of East Germany. The family run company, which was set up in 1992, serves customers all over the world and manufactures special machines for niche markets in the textile industry. In particular, the company has a wealth of Malimo experience through its past connections to the original Malimo company. In addition to its own know-how and skill, Christian Pinkert also cooperates closely with the Chemnitz University of Technology and the Sächsisches Textilforschungsinstitut (Saxon Textile Research Institute) in product development. As a Karl Mayer licence holder, Christian Pinkert will manufacture the entire range of Malimo stitch-bonding machines in future, including the Malivlies, Maliwatt, Kunit, and Multiknit machines, including all of the optimised and customised features. Karl Mayer says it will continue to provide key areas of expertise for the machines and will transfer all of its knowledge of the Malimo technology to the new manufacturer. In addition to producing the machines, Christian Pinkert will also take on the marketing and distribution, assembly, commissioning, servicing and spare parts provision. The company will also provide customer support when developing products which Karl Mayer says will guarantee the seamless transfer of the Malimo technology. Stitch-bonding technology, together with its variants, Malivlies, Maliwatt, Kunit and Multiknit have been established in market niches for many decades as innovative processes for producing mechanically bonded nonwovens. By modifying and engineering the process, nonwoven products can be manufactured for many industrial applications and are used in the automotive industry for example for their special properties. For many years, the machine technology for producing stitch-bonded nonwovens has been perfected and distributed worldwide by Karl Mayer. Karl Mayer has been particularly successful with the Multiaxial variant of the technology for high performance glass and carbon fibre composites.